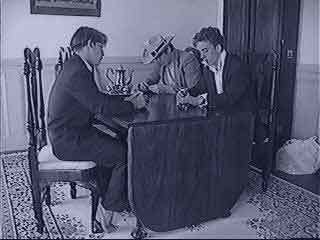 The scene opens with three rich people playing a game of poker. Theo Folio: Count your money boys, cause your gonna loose it, you gonna loose it all. Listen here guys, you understand what life is all about? eeehhnn Takes a sip from a glass mmmmmmmmmmm You ready to begin? Theo: Standard rules, five cards a player, dueces wild. Theo deals out their cards Theo: Good luck, because you'll need it. Because I'm going to beat you! I'm gonn take all your money. Shane: You always say that and you always loose, quit dissapointing yourself. Theo: Looks at cards and has two aces and three 8's Ohhhh yeaahh. Manchestor: Looks at cards and has a 7, 2, 9, 4, and a Jack. Switches them around looking for a combination, and finally throws them away. 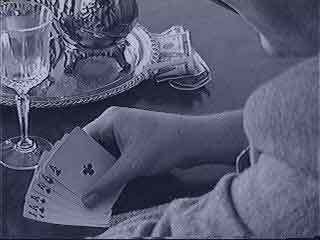 Manchestor takes a sip from his glass and a stack of cards falls from his hat, which he quickly scoops up. Shane: Let's start this off with...a thousand. Manchestor: I see you your thousand, and raise you....5 thousand. Theo: We'll make this more interesting...we'll bring this up to around, say...one million dollars. Manchestor: You must be very confident. Shane: It's a lot of money, are you sure about this? Shane: You wouldn't be bluffin again would you? Theo: Nooo, it's all there. I'm gonna beat you boys back to school. 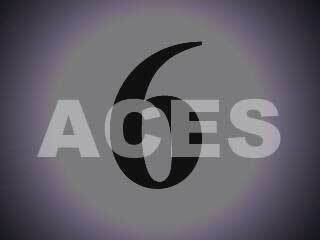 They show their card hands Theo: Full house, 8's over aces, read 'em and weep. Shane: Well Theo it looks like you lost your money. I've got a royal flush. See if you can beat that. Shane: Well manchestor, it looks like you've won again. Theo: I loose again, I loose again! Manchestor: No, I grow tired of playing this game. Theo: Shall we bet more money? Manchestor: No, I have another idea. Shane: You've spent all your money already. Manchestor: It's an entirely new game.